The British Antarctic Survey approached Vorticity Ltd for assistance in designing and validating the descent and landing system for the Javelin Sensor. This is a 2.5 m long, 5.5 inch diameter sensor which is intended to be implanted in the Pine Island Glacier on the West Antarctic Peninsula. The sensor comprises a GPS receiver and radio modem which provides position data over an operational lifetime of over a year. The sensor is designed to be partially buried in the glacier, leaving a significant proportion protruding above the surface at the beginning of life. During its operational life, it is expected that snow will accumulate on the surface so that the top of the sensor will be flush with the surrounding glacier surface at the end of its operational life. Twenty five Javelins are currently deployed in the Antarctic and are gathering invaluable data to determine the effects of climate change on the Pine Island Glacier. The objective of this study was to provide assistance to the British Antarctic Survey in defining the descent system for the sensor to ensure it achieves the correct penetration depth into the glacier and remains in an upright position following landing. 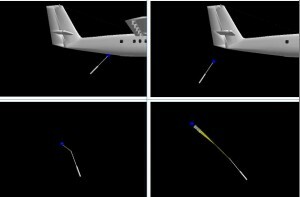 The requirements were to deploy the sensor safely from a BAS Twin Otter aircraft through an existing sonabuoy launch tube without endangering the aircraft and then to control its attitude and velocity during its descent to the ground. In order to ensure the correct penetration, the descent velocity had to be carefully controlled through precise sizing of the parachute and the sensor had to impact in a vertical orientation in order to ensure good signal reception and to maximise its life. The drop altitude would ideally be as low as possible in order to optimise targeting accuracy. The parachute system thus had to be designed to achieve and maintain a vertical orientation as quickly as possible. Vorticity provided consulting advice to BAS on parachute design. The parachute system comprises a parachute and, just as importantly, a deployment system to ensure it opens reliably without endangering the drop aircraft. Vorticity’s study took account of the beacon design and its geometry; the mass properties of the beacon; parachute attachments; impact requirements; drop conditions, aircraft constraints and aerodynamics. Parachutes were sized in order to achieve the required rate of descent with four rates of descent specified.